I was born to compete. Perhaps it's due to the fact that I'm a third born who had to scrap with an older sister and brother; all born within a 3 and ½ year span of each other. Though my "eye of the tiger" has dimmed somewhat with age, my competitive juices still flow. A few years back, one of the young lions in the family, my nephew Jake, challenged me to a one-on-one basketball game. He had me down by about 8 baskets and only needed 2 more to win. When we returned home, his mother asked him how the game turned out. Jake lamented about how embarrassing it was to lose to an old man. His mother responded, "You don't understand, Jake, he won't lose!" If you hadn't figured it out, I won. Perhaps that is why as a competitor I'm drawn to Isaiah 11. The prophet proclaims that from a shoot from the stump of Jesse the Messiah will bring a time when natural competitors will tame their quest to dominate. Instead they will share in God's love together. In my mind, there is something beautiful when dominant creatures lovingly step back to walk alongside those with whom they compete. To me, this is what it means to act Christ-like. The woman with the water bottle in her hand is a world class runner who was attempting to win the contest. 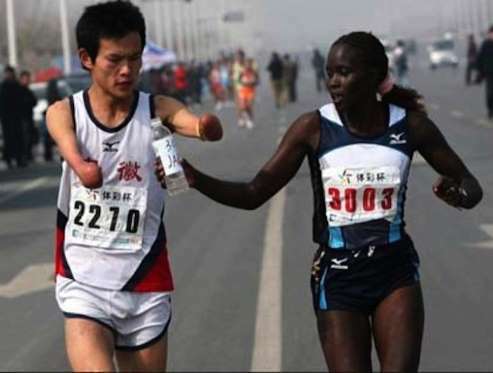 She is pictured slowing down to offer water to a fellow runner who was not of her caliber. This Advent season, who will slow down to help? Grant us the eyes to see, O Lord, the opportunities you present us with to share the love of Christ. Inspire us to reach out beyond ourselves to offer a helping hand and a cool drink of water to those in need. Amen.